Prayer Meditation for Holy Thursday - My Catholic Life! My Most Precious Lord Jesus, this night You gathered with Your Apostles to share with them Your last meal. But this was no ordinary meal. This was the gift of Your most Sacred Body and Blood, soon to be broken and poured out on the Cross for the salvation of the world. Allow me, dear Lord, to spend this night in prayer and meditation with You. After the meal, You invited Your Apostles to join You for one hour, to stay awake and keep vigil as You prepared for Your arrest. The Apostles fell asleep, leaving You in Your bitter agony alone. 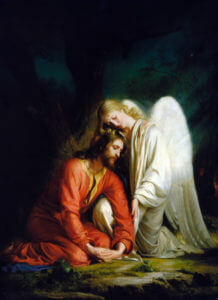 I accept Your gentle invitation of love, dear Lord, to spend this night in vigil with You. May I enter Your Heart as it faced the coming persecution You were to endure for my sins. May I console Your Sacred Heart and know the love and Mercy that flowed forth. Lord, when I face the crosses of my own life, give me Your divine courage and strength to say “Yes” to the Will of the Father. Your love for me is abundant and is perfect in every way. Help me to know that love, to embrace it and to allow it into my life. I make my vigil with You this night, dear Lord. I love You, help me to love You with all my heart. Jesus, I trust in You.